This post got delayed and there haven’t been quite as many multi-billion tech investments in the news this week. But for any coming down the pike, I’m voting for more steel (or carbon fiber or whatever) in the ground. It provides a vivid counter to the hand wringing around jobless innovation that followed the Facebook/Whats App acquisition. Certainly some new technologies today (as in every era) may threaten today’s jobs, but we should be careful to separate the impacts of disruptive technologies from other trends that keep us from getting the benefits we should from innovation. Too much emphasis on big, quick payouts over longer term productive investment and on innovation alone over the things that embody that innovation has been damaging job creation for years, and the gigafactory is a salutary counter example. Turning innovation into jobs requires investment not just in ideas, but in building the products that embody those ideas. Not only does choosing to build cutting-edge products in the U.S. enhance the overall economic value of innovation to the American economy, but feedback between technology innovation, manufacturing, system integration, and product improvements are critical to sustaining an innovation edge. High tech manufacturing is a compelling path to job growth in the US. Tesla is projecting 6500 jobs at the new factory. Is that as many direct jobs as a $5B investment would have created 30 years ago? Of course not. Today’s manufacturing is much more capital intensive. But it’s approximately 500 times as many jobs per $ billion as the WhatsApp investment. Furthermore, the capital intensiveness of today’s advanced manufacturing is part of what makes the US newly competitive. Today even comparatively well paid labor is a small fraction of total product cost, so quality, co-location of engineering with markets and the supply chain, scale (see below), and the relationship between management and workers (that’s another blog) can be much more important. If Tesla’s stock price doesn’t already have you convinced, the EV – and the energy storage market – is SO not dead. 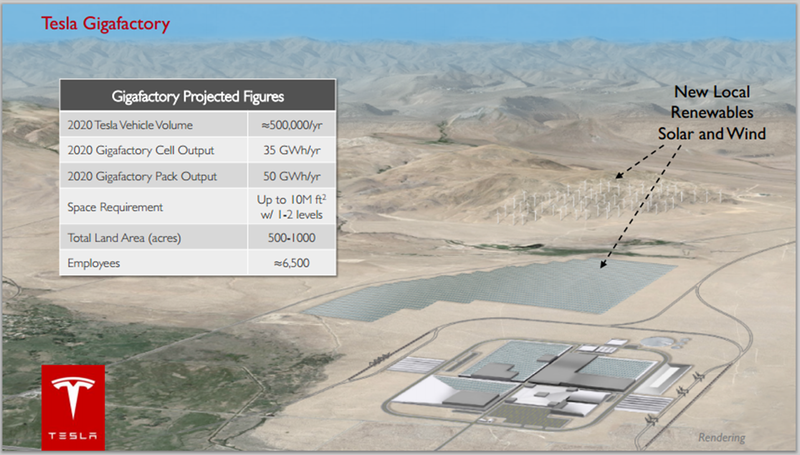 The gigafactory as described will have the capacity to build more batteries alone than total global production today. Tesla has the necessity or the luxury of being more single minded, but virtually every automaker worldwide is investing, and some like GM are investing heavily, in vehicle electrification, in batteries, and in the connection of vehicles to the home, business, and to clean energy generation. Numerous energy companies are similarly focused. This isn’t just because of the economic, environmental, and political attractions of leaving the gas station behind. It’s because electrification, energy storage, and machine to machine technology, are on the cusp of delivering cars, homes, businesses and energy systems with transformative functionality. Put differently the gigafactory – and these other U.S. investments in advanced vehicles, energy storage and energy management – leverage disruption in cars and power, both central to the American way of life and to preventing runaway climate change, and do so in ways that help ensure the American economy and American workers are part and parcel of this disruption, not left behind by it. And speaking of American ingenuity…its payback time. Let’s take some time to heap scorn on those who naysayed the government’s overwhelmingly successful investment portfolio in clean energy and advanced vehicles technology. The DOE’s Advanced Technology Vehicle Manufacturing loan program provided Tesla $465 million loan (that’s nearly half a billion dollars) at a time when it, like the rest of the industry, was in dire economic straits and when the financial sector was unwilling to take on risky automotive projects. Tesla used that loan to retool its factory in Fremont, California to build the Tesla S (a factory that in another era was the site of an innovative partnership between GM and Toyota), it paid taxpayers back that loan early, and now the US economy is seeing an additional payback at even greater scale. Finally, it’s hard not to love/hate/envy a guy who gets a cameo in Iron Man. But I have to credit Elon Musk for being what I hope is the leading edge of a cultural and strategic shift in Silicon Valley – a hot IPO, corporate statements on Twitter, plus steel in the ground.